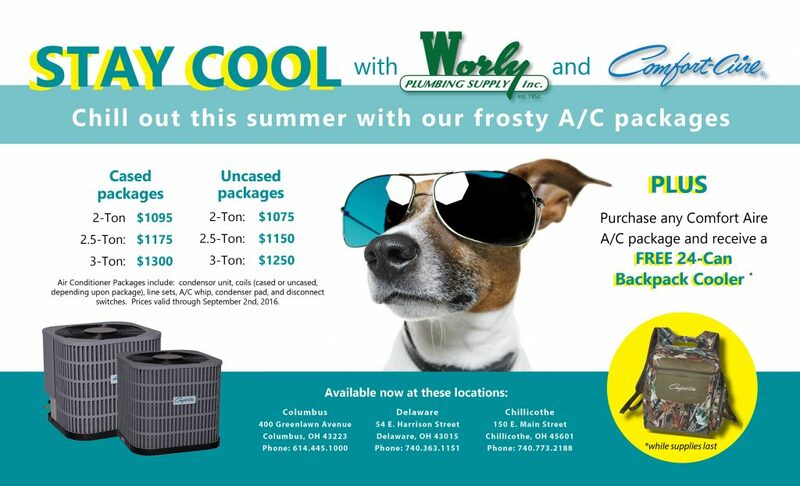 Now at Worly Plumbing Supply, take advantage of great pricing on Comfort Aire A/C packages! Conditioned air means comfort and Comfort-Aire is in the business of making you comfortable, whether at home, work, school, or at play. Comfort Aire cooling products meet or exceed industry standards for energy efficiency and they’re designed for reliability. Plus, when you purchase a Comfort Aire A/C package at Worly this summer, you’ll receive a free camouflage-print backpack cooler that holds up to 24 cans. Get yours while supplies last! This offer is available at our Columbus, Delaware, and Chillicothe locations. Stop by or call us today for more information about this offer.